13 Jul 2017 / 10:52 H.
PORT-AU-PRINCE: After two decades with no army, Haiti has announced plans to rebuild its military to handle disasters and smuggling, though some fear the force could return to misdeeds, and be a tool of oppression. 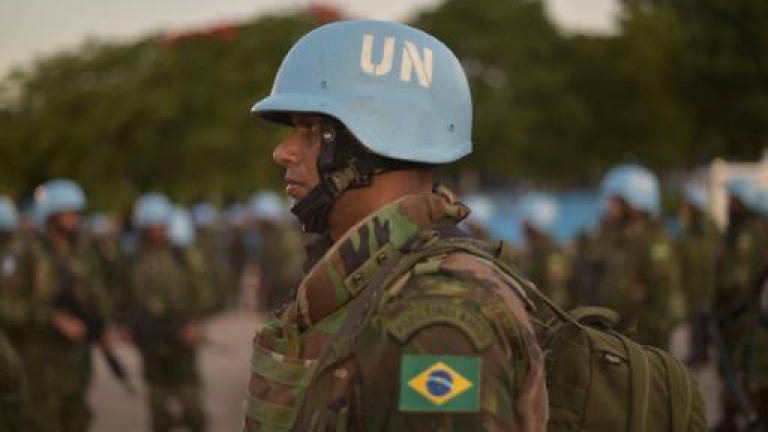 The poorest country in the Americas has announced an initial recruitment of 500 men and women aged 18 to 25, invoking the need to "reclaim national sovereignty" as a 13-year UN peacekeeping mission, known as the blue helmets, comes to an end. The UN Stabilization Mission in Haiti (MINUSTAH) was deployed in 2004 to stem violence following the sudden departure of former president Jean-Bertrand Aristide, and is set to leave in October amid an improving security situation and a successful electoral process after two years of political turmoil. It will leave behind a residual training force of international police officers. "The departure of the blue helmets is a challenge, but it is something we have planned for," Defense Minister Herve Denis told AFP. The government says it plans to deploy troops along the border with the Dominican Republic in the fight against smuggling, and in regions hit by natural disasters. Denis added it will also wage war on terrorists: "Even if there isn't a high threat-level, we still have regional responsibilities," said Denis, while recognizing that, for the time being, the chronically unstable country is not being threatened by any external enemies. Re-forming an army is merely a requirement of the country's constitution, which calls for a military alongside the police, Denis said, but added he prefers to use the term "defense and security force." "I want people to understand that it's a new kind of institution that we want to create, one which is with the country in its quest towards development," he said. A major part of that rebranding effort is the institution's checkered past. Haiti's armed forces were dissolved in 1995 by then-president Jean-Bertrand Aristide, who was ousted in a military coup seven months after he took power in 1991 – bringing an end to decades of political interference and dozens of coups. But the nation has a bloody history of brutal militias, which brought terror to the mountainous Caribbean nation under various leaders. More than 20 years after the soldiers were sent home, the fresh recruitment drive is causing disquiet among civil society groups. "There is no legal framework to define the missions of this army," said Pierre Esperance, director of the National Network Defense of Human Rights. "Those in power want to create a political militia or a paramilitary group, not an army." With Haiti's total national budget just $2.2 billion (RM9.5 million), the cost of the force – which will eventually count between 3,000 and 5,000 staff, has been questioned by local and foreign observers. "It would be better if authorities concentrated their efforts on the national police force...who should be better equipped to do their job," said Esperance.